Can the blood pressure monitor be used without being connected to the internet? Yes, the blood pressure monitor works like a normal blood pressure monitor when there is no connection available. Yes, the device allows for any number of users. In addition, the free IvyHealth app also allows different people to register, each with their own password, even sharing the same mobile phone. Just login with the particular person’s data. You are recommended to take the logical measures as regards hygiene if the device is used by more than one user, such as cleaning the cuff. Yes, unlike other brands, the IVBPA wrist blood pressure monitor allows you to send your complete records to your doctor, not just the latest measurement. This blood pressure monitor complies with all the requisites of the European Community for this type of device, making it totally reliable. Its precision is +-5 mmHg. It is important for you to follow the instructions so that the readings reach this degree of precision. Whether you are experiencing a health issue or looking to prevent one, keeping regular and accurate records of your blood pressure and pulse rate can be a very helpful tool. A blood pressure reading on the high side means that your heart is having to strain to pump blood through your arteries, and a fast pulse rate may indicate that you’re experiencing an arrhythmia. Both irregularities, particularly if sustained over time, can be an indication of cardiovascular problems. If you have been diagnosed with either condition or are interested in catching them before they become a bigger issue, it’s advisable to closely track your blood pressure and pulse rate. The Ivy Health wireless wrist blood pressure monitor gives you the freedom to stay on top of your heart health on the go. Compact and highly precise, it works in tandem with the free Ivy Health app to track your measurements and conveniently store them in the cloud. You can monitor your health from any location, and easily share the data with your physician should any concerns arise. 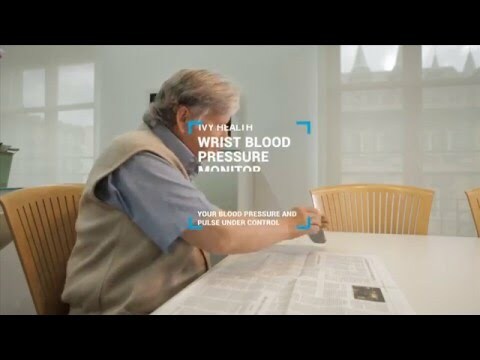 Seeing a complete analysis of your blood pressure and pulse rate over weeks or even months gives your healthcare provider the unique ability to spot potential warning signs as well as make changes to your current lifestyle and medication if warranted.